Our Hollinwood Business Centre in Oldham held a fundraising event last week, which included our centre manager being locked in the stocks! 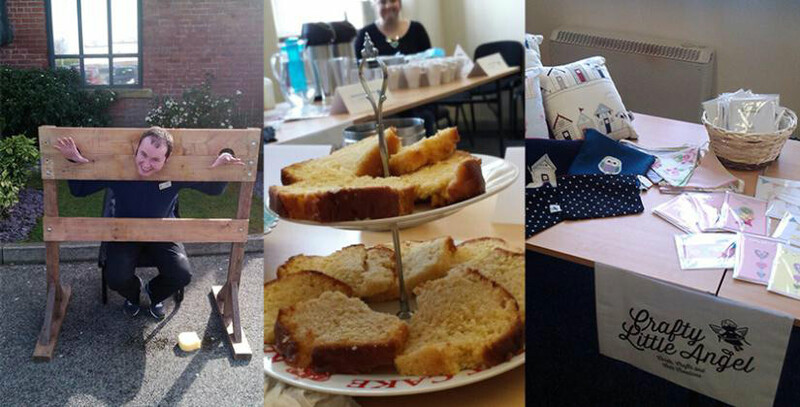 Customers at one of our business centres have worked together to raise money at a charity event. Hollinwood Business Centre in Oldham held a charity day last week, organised by Centre Administrator Amy Bierman, with proceeds going to the Alzheimer's Society. Business Centre Manager Peter Kevins did his bit for the charity by offering to go into the stocks and have wet sponges thrown at him. I'd like to thank Amy for organising the entire day. Thanks to her hard work we have collected more than £170, smashing our initial target of £100 - and the total is still rising. The event also included a bake sale and a book stall and items left over at the end of the day have been placed on sale at the centre reception, allowing people to carry on donating. Local author Joe Hanley also attended the event, to talk about his debut novel, Smiles and Moods. Peter says the Hollinwood centre has a great sense of community spirit, with customers often working closely together. “There has always been a nice little community of businesses here and everyone is always keen to get involved with things,” he explains. Our Hollinwood centre was originally a Victorian cotton mill and it still retains its historic character and beauty. The building has now been fully converted into a modern business centre with offices and studios in a range of sizes. Its convenient location near the M60 along with its large free car park makes it a popular choice with businesses. And our onsite team can offer secretarial support services including faxing and photocopying as well as a mailbox service and a range of meeting and conference rooms. For more information contact Peter Kevins on 0161 684 2319.